2018 has been an interesting year for the Indian share markets to say the least. While mid and small caps did great in 2017, large caps have clearly outperformed this year. Mind you, last year, when mid and small caps were having a dream run, select large caps also gave decent returns. Now with mid and small caps collapsing, these select large caps are not only showing resilience to the fall but are outperforming. We know the reasons for the collapse in mid and small caps - bad corporate governance, auditors resigning, weak business performance, high valuations, etc. That is the reason why Tanushree, editor of StockSelect, firmly believes in recommending only safe, blue chip, large-cap stocks. But the big question is - Are all large cap stocks safe blue chips? I mean, I agree that large caps are a relatively safer. But is it right to conclude: all large caps = safe blue chips? Is it right to conclude the valuations of large caps provides enough margin of safety? Is it right to conclude large caps cannot fall as much as 30%? Is it right to conclude there cannot be any frauds in these companies? Remember Satyam? It was a large cap. Punjab National Bank is a large cap. PC Jewellers had a market cap of around Rs 240 billion recently. In fact, Vakrangee had a market cap of Rs 500 billion! While all these companies were classified large caps, they all proved to be wealth destroyers. Market capitalisation is not the right way to judge safety and quality. The formula... large caps = safety and quality is incorrect. In fact, Tanushree believes, safety and quality are not very common among large cap stocks. For Tanushree it's the quality of the business (reflected in financials) and management (reflected in shareholder friendly behaviour) that tells her what a safe blue chip is. Strong and proven business model with long operating history. Strong management with right incentives and ethical behavior. Businesses with strong financials and robust return ratios. Businesses with a long runway for growth. Consumer facing businesses with favorable working capital position. These 7 Stocks Could Potentially Build One A Hefty Retirement Nest Egg. Building a retirement nest egg isn't easy by any means. To be honest it could be tricky if one doesn't invest in the right stocks. But with our premium service Stock Select which has an undisputed track record of delivering a WIN percentage of nearly 74% in the last 16 years, building one's retirement nest egg becomes way easier. In fact, Tanushree Banerjee, the editor of StockSelect, has just put together a report containing 7 stocks that could potentially build a solid retirement nest egg for her loyal Subscribers. 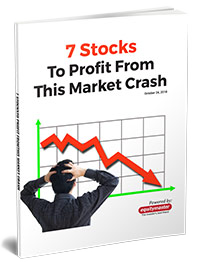 Click here to claim your FREE report and an additional year of StockSelect for FREE. But that's not all. Tanushree likes to recommend businesses with these qualities only when they are available at attractive valuations. She has mastered the art of recommending safe blue chip companies over the years. And in times like these when the markets look gloomy, her approach to investing is probably all you need for the next 3-5 years. While we believe this is right time to have a re-look at your portfolio and take some tough decisions, at the same time, investing blindly in the large-cap stocks cannot be your answer to safety and quality. If history is to be believed, companies classified as large caps have also failed the test of 'quality'. Surprisingly, the current mood in the market is to dump the entire mid and small cap space and buy large caps in the name of quality. Many fund managers believe, in uncertain times like this, one should stick to quality large cap stocks. Well, to an extent, I agree with them. But for me... irrespective of market sentiment or market cap, sticking to quality stocks is the only mantra. I mean look at the recent examples like Vakrangee, Punjab National Bank, PC Jeweller. If someone would have mistaken market cap for quality, he would have paid a hefty price. This Was a Large Cap. But Was It Safe? In January 2018, PC Jeweller's market cap was in north of Rs 200 billion. So, if your metric for safety and quality was market capitalisation then this company may have qualified. However, once the Vakrangee episode broke out and there were serious questions on PC Jewellers corporate governance practices, the frenzy was over. It is a small cap now, with a market cap of around Rs 50 billion. That's where Tanushree's safety first approach to investing comes handy. She strongly believes all large caps are not necessarily blue chips. She judges 'Safety & Quality' by looking at metrics like long term ROEs, robust operating cash flows, lean balance sheets, managements credibility, and transparency in the books of accounts etc. You can sign up for Tanushree's StockSelect recommendation service here. PS: Tanushree Banerjee, editor of StockSelect, is giving away a FREE report to her loyal readers containing 7 stocks that could potentially build a solid retirement nest egg. Click here for details. Equitymaster requests your view! Post a comment on "These Are the Kind of Blue Chips You Should Invest In". Click here!